This Lees Summit ranch is stunning from top to bottom! Open floor plan, beautiful hardwoods, granite counter tops, five burner gas stove, & walk in pantry. Master has access to large covered porch, master bath with laundry & walk in closet-vaulted ceilings. Finished basement has tons of space to entertain, a full bar/kitchenette, tons of storage, and 4th bedroom and bath. Across the street from path leading to the lake and many HOA amenities! Stunning home in Pinehurst! Completely renovated ranch with a very open feel. Hardwood floors throughout and beautiful built ins for extra storage. Stunning kitchen with updated counters, cabinets, and backsplash. Formal living and dining rooms. Lots of light! Extra living space in lower lever rec room. Tons of basement storage and workshop room. Patio off the family room. This 2 story has been beautifully remodeled from top to bottom. Gorgeous kitchen with granite counters. Updated flooring throughout. Home features a formal dining room, formal living room/ office, great room, open eat-in kitchen, finished basement, and so much more! Large garage for lots of storage space. Light and bright 1.5 story in Overland Park! Master & 2nd bedroom on main lever and 2 additional bedrooms upstairs. Great room has high ceilings and is open to dining room and kitchen. Chefâ? ?s kitchen has granite, island, extra large pantry! The master suite has a large shower and great closet that connects to the laundry room for convenience. Relax on the covered patio and enjoy amazing HOA amenities. Make yourself at home in this beautiful 5 bedroom, 4 bathroom, 3,700 sq. 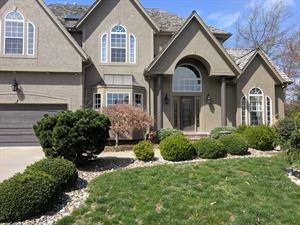 ft. home in Overland Park that has everything you've been searching for! This spacious home features an inviting island kitchen with beautiful granite counters, and lots of cabinets. Relax in the cozy living room, or entertain in the formal living and dining area. Large master suite with spa like retreat featuring dual sinks, luxurious tub, and separate shower. Spacious secondary rooms, and built in desk at the top of the stairs! Enjoy the warm summer days on the patio with gorgeous nature views! Be sure to schedule your showing today! Stunning Lenexa home! Custom build with open floor plan. Master bedroom, guest suite or office both on the main level. Chefâ? ?s kitchen with granite, custom cabinets, and walk in pantry! Beautiful features and upgrades throughout the home. Finished, walk-out lower level with beautiful wet bar. Whole house sound system, stamped patio, and wooded lot. Gorgeous home in Crimson Ridge!!! Lovely two-story home that exudes warmth and comfort. Step in to the vaulted entry with gorgeous staircase. To the right is a den/formal living area connected to the formal dining. Kitchen features crisp white cabinetry, quartz countertops, stone backsplash, pantry, and sunny breakfast room. It opens directly into a light-filled great room with built-ins. Upstairs you will find a master retreat with tray ceiling, large master bath! Chef & entertainers dream kitchen in prime location! Huge work island, ample cabinets/pantry with roll-out shelves, vaulted ceilings, loads of windows for natural light, and backyard access. Space is large enough for big gatherings with counter bar space & eat-in area. Updates on all floors. Main floor offers 3 large bedrooms, master with bathroom access & walk-in closet!Lower level with second living space and additional full bath. Enjoy the gorgeous water front in a beautifully renovated home with over 5000 square feet of living space. Private backyard with mature trees. Home also faces a private cud-de-sac. Home boasts gorgeous and large kitchen, hearth room, formal living room, dining room, office, and a grand, curved staircase. Master bedroom with sitting room. Finished walk out basement includes 2 bedrooms, full bath, family room, bar, and leads to patio and large lower deck. Gorgous views from each window.